How do I request Special Order or Out Of Stock parts? Why do I have to pay a surcharge on some items? Is it refundable? What tyre size should I use on my Morris Minor? What tyre pressures are recommended for my Morris Minor? How do I go about getting insurance for my Morris Minor? Do I get free road tax on my Morris Minor? How does that work? Will my Morris Minor run on unleaded fuel? What oils and fluids are recommended for my Morris Minor? What lubricants are recommended for my Morris Minor when it needs servicing? I have a paint code for my Morris Minor. What does it mean? What does the chassis number indicate on my Morris Minor? Can I have my Morris Minor converted to lefthand drive? Can I have my Morris Minor Saloon converted to a Convertible? Can my Morris Minor have an automatic gearbox fitted? 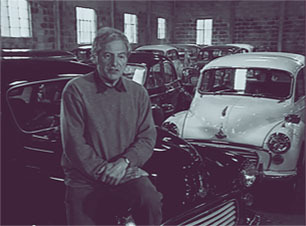 What windscreen wipers does my Morris Minor need? 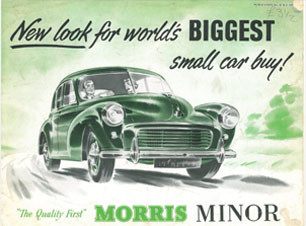 All Morris Minors are classed as “historic vehicle’ for road tax purposes. Under new laws being introduced on the 20th May 2018 any vehicle made before 1977 is MOT / SVT exempt if classed as a Vehicle of Historic Interest (VHI) (which is a different classification from ‘historic road tax’) and exemption has been requested. To class your vehicle as a VHI you need to show that there have been no substantial changes to the vehicle in the last 30 years. This is going to be a tick box submission at the time of renewing tax exempt status. If in any doubt do not claim exemption and get more advice. Keepers of VHIs exempt from periodic testing continue to be responsible for their vehicle’s roadworthiness. The MOT is a road safety test. This covers brakes, play in the trunnions as well as areas of rust which threaten the integrity of the vehicle. Unless you have your own rigorous safety test that you use to check your own car, there is often no sure way of knowing that the car is safe without taking it to a professional. The vehicle’s keeper is responsible for safety. The degradation in performance of brakes and other safety aspects is often a slow imperceptible decline. The danger is that you could be driving around in a car that is unsafe, but you would never know until it is too late. You may think that when your car veers to the left due to unbalanced brakes this is just a quirky characteristic.It is in fact dangerous and an MOT would draw your attention to the need to get this problem rectified. Keepers of vehicles over 40 years old can voluntarily submit vehicles for testing. The exemption only applies to those vehicles that have not had any permanent changes in the last 30 years (1988) to areas of safety or performance. The guidance is open to interpretation here. Some say that if you have had a brake servo, disc brakes or suspension upgrades fitted in the last 30 years your car still requires an MOT / SVT (though an engine upgrade using the same type of engine but with more power does not count as a substantial change). However, there is also an argument that as the key areas of these upgrades are using parts that were available within the 10 years after the cessation of production there is no need for an MOT.We are still not sure how this will be decided in practice.If in any doubt do not claim exemption.See government guidance below. Any insurance claim in the event of an accident will need to show that your vehicle was safe to drive. Any mechanical investigation which shows this wasn’t the case may invalidate your claim. So though you are not required to have an MOT to make a successful claim it will be easier for insurance companies to dismiss claims if it is found that your car wouldn’t have passed safety standards commensurate with the age and use of the vehicle. Pre 1960 vehicles which are currently exempt from the MOT may find that the new rules mean they will have to have an MOT if they have been substantially changed. We recommend that if you use your Morris Minor on public roads you should have an MOT even if it can be classed as exempt. This allows for peace of mind for you and other road users. It also maintains ones awareness of the long term condition of your Morris Minor through advisories. E.G. rust, brake or suspension issues. Please continue reading for the government’s guidance on SVT exemptions. Whether you have an existing account or are a new customer please follow the registration procedure below. Go to register at the top of the home page. Fill in your details starting with your full name: Forename and Surname in the one box. Then fill in your other details as usual, create a password and do some simple maths to show us your not a robot! If you have no existing account with us you will be able to buy goods as soon as you are registered. If you have an existing account with no email address stored you will be able to register as in 1. above. However if you then wish to link your account please contact the parts department and they will link your web account. to your existing account. Not all items on the website are available to purchase via e-commerce. Please note that if you include an out of stock/Awaiting Delivery/Special Order item in your order it will turn the whole order into a request email. If you have parts you need urgently then please keep your order requesting these parts separate. This may be due to packing restrictions, used part availability, a special order or the product hasn't been activated for direct online ordering. Where a product is not available it will be shown as "Awaiting Delivery". It may be a special order - such as Trim Kits or a used part, or we are waiting for delivery from a supplier. If you put this item into your basket it will generate an order request. No payment will be required. One of our Stores personel will reply to your email or give you a call with details of availability and time scale. E.G. a complete trim kit will take up to 6 weeks and need a careful discussion to ensure the correct goods are ordered. We are always happy to help over the phone or via email. Where old units are required for reconditioning a refundable surcharge will be levied on the item being sold. This encourages you to return your original part so that it can be reconditioned for a future customers use. The surcharge can only be refunded once we have received the old unit and have ascertained that it is in good enough condition to be reconditioned. We cannot refund a charge on units beyond repair. If in doubt ask. Please see Exchange Units below. If you are an overseas customer returning an item in order to reclaim the surcharge it is important that you mark that the item is a RETURN on the import document, otherwise we are charged an import fee and VAT on the value of the item, as if it is new goods. You co-operation is appreciated on this matter as it will save us administration time and charges. It is important to remember that "rebuilt" does not mean "brand new". Rebuilding a unit involves stripping, cleaning, inspecting and re-assembling the unit. During this process, parts showing signs of wear will either be completely replaced or suitably renovated. However, it is not always feasible for major sub-components to be replaced with brand new ones, for example, an exchange engine will not have a new block. Due to the nature of certain product lines, some items can only be offered on a "one for one" exchange basis. This effectively means that you must offer us a viable unit before we can release a fully rebuilt item from our stock. In some instances we can only carry out reconditioning of your own unit. Our staff will inform you if this is the case. All exchange units are subject to a surcharge. This surcharge serves two purposes; firstly, it acts as an incentive for you to return your old unit, and secondly it provides us with financial cover if your returned unit proves unsuitable for exchange purposes. Whether or not your returned unit is suitable for exchange purposes cannot be ascertained until it is made available to us for inspection. As a general rule, suitable for exchange basically excludes any items that are beyond reasonable repair (e.g. crankcases ventilated with a connecting rod) or units irrevocably damaged. We are also unable to accept units unless they are returned in whole, complete form (i.e. differential units which are returned partly stripped with no bearings and all the shims missing are not generally accepted), nor do we accept a "box of bits". Surcharges will only be refunded once our workshop has passed the item as serviceable. We have predetermined prices for our exchange units based on our experience, what it will cost to repair a gearbox, axle or engine. Occasionally, however, the damage to the unit is so great that we will contact you before beginning work on your unit to advise you of any additional cost that may be incurred during the rebuild of the unit. We can return the unit (at your cost) if this proves unacceptable. If you are unsure whether your core unit is suitable for this please feel free to contact our sales team on 0117 300 3753, they will be able to help you with any questions. Alternatively you can visit the centre with the core unit and we will be able to give you a verdict then and there, or you can email a picture of your unit to parts@morrisminor.org.uk Please state in the subject line that you are planning to use it as a core item for surcharge refund. Shock Absorbers, Wiper Motors, Speedometers, Half Shafts, Early Water Pumps, Steering Racks, Dynamos, Starter Motors, Prop Shafts, Radiators, Axle Casings, Dove Tail and Pins,, Camshafts, Crankshafts, Rocker Shaft Assemblies, Bronze Fuel Gauge, Early Vacumn Unit, Wheels, Trafficators, Flywheels, Carburettors. 155 x 14 or 145 x 14. Please Note: 155 x 14 tyres will only stow in the spare wheel bay on the Traveller so the saloons and Convertible are more suited to 145 tyres. 28 psi all round for radial tyres unless fully laden in which case 28psi at the front and 30psi at the rear. Crossplys should be 22psi all round unless fully laden in which case 22psi at the front and 24psi at the rear. 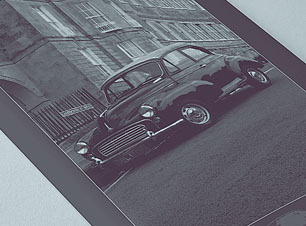 Though we don't offer insurance ourselves we can give you a list of insurers who deal with classic cars. Please call us on 0117 3003 754 for more details. Converting to unleaded fuel: - the generally accepted way to convert a vehicle to run on unleaded fuel is to change the valve seats and the valves and we carry out this type of improvement regularly. This costs approximately £330.00 for parts and labour. Although this is the accepted way forward, it can be troublesome; an example of this is, an engine that is running perfectly and doesn't lose any oil, is then converted to run on unleaded fuel by changing the valve seats and valves, but keeping the original block. Within one or two thousand miles of driving, the vehicle starts to burn oil. This is because some of the exhaust gases that would have naturally escaped through an average cylinder head are trapped perfectly by the new cylinder head and pressure is put down into the pistons. The additional oil used manifests itself as excessive oil consumption, visible smoke through the exhaust system and also because of the hotter running temperatures of unleaded fuel, the oil in the upper cylinder is burnt on to the valves and as the exhaust gases escape past the valves, a hot spot is created, which then burns the valve out prematurely. So a well meaning attempt to convert a vehicle to unleaded fuel, results in some major engine work to be carried out maybe 5000 miles later. So our recommendation would be to fit a catalyst on the fuel system, this is a cigar shaped gizmo, which is fitted on the fuel line, and as the fuel passes over the tiny pellets enclosed, microscopic amounts of tin are collected by the fuel and the tin becomes the lead replacement. The catalyst lasts for up to 100,000 miles. We have been using these for approximately 10 years and have nothing but good reports about them. In the future, when the engine needs to be rebuilt through general fair wear and tear, then the engine will at this point be converted to run on unleaded fuel by changing the valves and the valve seats. When the engine is reconditioned all the potential problems of fitting a new head to an older engine are overcome. Also Known as Replica or Post Production convertibles. We take a 2-Door Saloon and change it into a "Tourer"/Convertible by removing the roof and strengthening the Chassis. With over 30 years experience one can hardly tell the difference. Visit our Conversions and Preservation options page for more information. But ideally give us a call to discuss your requirements. Basically, fitting an automatic gearbox into a Morris Minor is not an easy operation, as the only box that fits sensibly is the Marina, but these are no longer available. The best solution would be to buy a Marina automatic saloon, which is very rusty, but has a good engine and good automatic gearbox. The engine and gearbox would need to be removed from the Marina and fitted into the Morris Minor, but this is a much larger task than it would first appear. Also, because an automatic does not have engine braking, you would need to increase the power to the brakes. Stage one therefore would be to decide on the quality of traveller you require. Please see our website to get a general idea of the price of a decent Traveller; this will give you some indication on prices, but of course, these vehicles are not automatics. Therefore, the likely cost of the modification, bearing in mind the credit, it would be sensible to allow £5969.00 plus of course the cost of the traveller itself. Please note that while the cost of the vehicle itself would include VAT, whereas VAT would need to be added to the cost of any repairs/modifications. Please also bear in mind that it could take in the order of 8 – 16 weeks or perhaps even more to obtain a donor Marina automatic vehicle. As you can see, it’s not straightforward and it can be expensive. I’ve said eight to sixteen weeks to obtain a donor Marina automatic vehicle but this could be longer, and it would probably take another six weeks to deal with the job. You also need to be aware that vehicles with a small engine – ie: 1300 – the automatic operation is a little bit sluggish and not like a modern automatic, but this would need to be discussed. To identify what wheels your Morris Minor has you need to know the J and PCD (Pitch Circle Diameter) measurements. Please download our Wheel Measurements J and PCD document for further help. To Identify which windscreen wipers and arms you need please download our Windscreen Wiper Variations document.